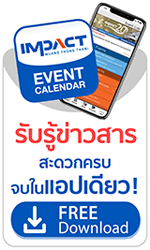 IMPACT Exhibition Management Co., Ltd., the operator of IMPACT Exhibition and Convention Center, Muang Thong Thani, is committed to conducting business with focus on quality as well as social and environmental responsibility. We do our part for the betterment of society by “touching people's life” and “connecting” with the society”, offering assistance to the less fortunate in our society through various CSR initiatives, for example, provision of employment opportunities to people from nearby communities and active collaboration on volunteer programs, social services, educational support services, provision of basic needs and environmental activities, with kind collaboration and support of our management team and all employees. We fully realize that hosting MICE events can cause negative environmental and social impacts because each event requires various materials, for instance, exhibition booths, exhibition boards, carpeting and paper as well as transportation. As a leading MICE venue in Thailand, IMPACT has a clear commitment to encourage and educate event organizers and visitors about the importance of using environmentally-friendly materials, energy conservation, and awareness of social impacts. ISO 50001 standard on Energy Management System. Shortly afterwards, IMPACT announced to implement environmentally-friendly business policy and initiated several environmental projects and campaigns, for instance, the replacement of electric appliances and air-conditioning systems, and the appointment of ISO working team to follow up and raise consciousness in energy conservation on an on-going basis, with an aim to reduce annual energy costs by 3% or approximately 13 million baht. In 2011, IMPACT successfully became Thailand’s first ISO 50001-certified convention center and the second venue in Asia after a power-station in India. In response to TCEB’s Sustainability Thailand model, IMPACT has formulated development strategy to continually drive the company toward sustainability. Examples of our sustainable practices include the purchase of organic rice from local farmers, discontinuing the use of foam food containers, the reuse of flowers used for decorating events, and replacing traditional light bulbs with LEDs to save energy. IMPACT has adopted sustainable business practices for the ultimate benefit of society and the country as a whole. Our development strategy towards sustainability is at the same level as those of leading national and international companies. We have set up the Standard Controls Committee to oversee and follow up the implementation of international standards including the TIS 22300 standard on Security Management System for Meeting Incentive Convention and Exhibition (MICE), the ISO 22000 standard on Food Safety Management System, and the ISO 50001 standard on Energy Management System. IMPACT is committed to annually allocate approximately 10 million baht for CSR projects including internal activities aimed at promoting energy conservation, environmental awareness-raising activities, activities involving society and local communities, charitable donations, provision of scholarships and sports equipment for schools in provincial areas, contributions to assist needy animals, participation in CSR activities organized by clients or organizers, and etc. Budget increase will be considered on a case-by-case basis or in case of emergency such as donations to assist those impacted by flooding. However, the budget does not include large-scale projects that require massive financial investment and involve changes in management systems, energy-efficient construction equipment, or the development and maintenance of management system standards. IMPACT Exhibition Management Co., Ltd., Bangkok Land Public Company Limited and IMPACT Growth REIT are responsible for overseeing and approving budget for each project. From our point of view, corporate sustainability is about development that meets the needs of the present without causing problems in the future, and the development must incorporate economic, social and environmental aspects. We have developed a policy to maintain a balance between business success, environmental care and social responsibility under our corporate culture and values that we live up to for more than a decade in order to achieve both short- and long-term sustainability goals and to be an exceptional leader in the MICE industry that achieves sustainability by reducing the consumption of resources. The essence of this strategy is achieving greater success with fewer resources. Under our sustainability strategy, we have made solid progress towards sustainable success, and we believe that long-term sustainability is of immense importance that will enable the Company to achieve even greater sustainable success in the future. Our sustainable development strategy and Corporate Social Responsibility (CSR) activities concern economic, social and environmental issues. Sustainable development is something far beyond environmental conservation; it is more like economic and social restructuring to reduce the consumption of resources, minimize environmental impacts, and promote harmony and peace between humanity and nature and among human beings for the well-being and happiness for all. At IMPACT, we have high ambitions for sustainable business and strong commitment to social and environmental responsibility. Economy – We are committed to delivering high value for our customers under our “Partnership for Success” corporate culture because “your success is our success”. In the meantime, we instill a strong environmental awareness among our employees and related parties and promote mutual understanding that our ultimate goal is not only to pursue private profits, but also mutual benefits for all parties. We continue to embrace environmentally-friendly practice or Green Meeting and comply with the ISO 20121 international standard for Sustainable Event Management to move the MICE industry towards sustainability. As a service provider with commitment to providing our customers with the best possible service, we are determined to relentlessly develop and improve our services in various waysincluding deployment of the latest and greatest technologies that do not cause any negative impacts on communities and the environment, although they require higher investments, for instance, energy-sufficient cooling control systems for air-conditioning, automatic on-off control system for the operation of air conditioners, and air-chiller machines. Other efforts include construction of lake to store water to use for watering plants, the use of eco- friendly food containers, and replacing pens and notebooks with pencils and notepads. Society – We have made substantial contributions to society and improved the quality of life of people in nearby communities as well as other parts of the country through various CSR initiatives, aiming to live together in harmony and happily with local communities. We also encourage our employees to take part in CSR actions such as the provision of opportunities for youngsters, donation of learning materials, educational items, stationery, toys and dolls for underprivileged and unfortunate children, the provision of relief packages for those who are affected by natural disasters, renovation of temples and public facilities, and the provision of employment opportunities for local people. Environment – We strive to protect the environment and conserve natural resources within the IMPACT Muang Thong Thani compound and surrounding areas to promote to promote sustainable ecological balance. Our environmental efforts include raising awareness of environmental issues among executives and employees, promoting energy saving behaviors, using alternative energy such as biodiesel for motorized vehicles at the Center, the implementation of I am 3R (Reduce, Reuse/Recycle, Replenish) management strategy to minimize environmental impacts, “IMPACT Go Green” campaign featuring tree-planting activities to add green areas to communities and restore nature. We consider corporate sustainability a business approach to achieve sustainable growth, not a burden. This Corporate Social Responsibility (CSR) policy takes effect from….onwards. IMPACT unveils its latest CSR project "IMPACT Touching Hearts, Sharing Love"
IMPACT took part in "Clean the City, Bring Happiness to People"